Sunshine Set This 6-piece set includes 2 foldable mattresses with a comfortable triangular headrest, two matching pillows and two bolsters. All have double stitched seams, and are stuffed with 100% Kapok for superior quality. Kapok is light, hygienic, hypoallergenic, very buoyant, breathable, resilient, and environmentally friendly. Kapok filled pillows and cushions have their own rather firm feel, unlike cotton or foam filled products These Kapok stuffed cushions can be used as day and guest beds, meditation and massage equipment, they are comfortable for writing, chatting, daydreaming, stargazing or watching TV. Our signature Triangle 3-Folds can be folded and stored away easily The radiant traditional Thai fabric works well with different interior designs, adding a splash of color to your home or garden. 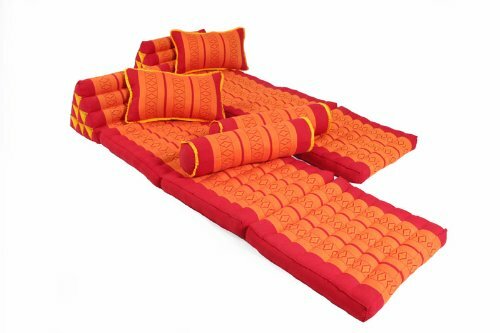 Set includes: 2 Triangle 3-Folds: 67x20 inches, Red&Orange 2 Support&Throw Pillows: 18x11 inches, Red&Orange. 2 Yoga&Neck Bolsters: 20x6 inches, Red&Orange.